You may be keenly interested in developing your own settlement terms and want to leave the court out of it. Collaborative law allows just that. The new process isn’t for everyone. Click below to learn if you are a good candidate. Who’s going to keep the house? Do retirement plans get divided in divorce? Does the cottage have to be sold? Particularly if you own a business, it’s important to make wise decisions about property since the impact will last well into the future. Mediation or collaborative law not for you? If you need a lawyer to ensure that you are not taken advantage of and your rights are protected, click below to learn more about how our firm does traditional litigation with a twist. You’ve worked hard for what you have. Don’t let the government make decisions for you. Make sure YOU are the one in control of health care and financial decisions. Plan now. Worried about how you will survive financially? Spousal support may be awarded in your divorce. The landscape has changed regarding spousal support in Michigan. Get answers about how if may affect you from an experienced attorney. The landscape has changed, how does it affect you? The consequences of failing to plan can be profound. Get answers from an experienced attorney that cares. You might be able to work with your partner to develop a settlement. If you aren’t sure how, a mediator can assist you to understand the issues and develop a solid agreement. 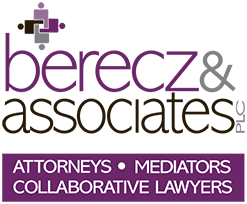 Click below to evaluate whether mediation could work for you. We have helped hundreds of parents navigate the adoption process. Whether you are placing or adopting a baby, adopting a child for whom you’ve been guardian, or are a stepparent who is parenting, we love helping you become family! Mediation was very positive route for my ex-spouse and I to remain in communication and to react positively towards one another. I think it actually helped our relationship because a third party was able to explain and make us comfortable with our decisions together.